This entry was posted in CCM Division, Education, EMC, exhibitions, Game Art & Animation, Game Design and tagged ECHO Center, Spacebox, STEM, VermontBiz on November 7, 2017 by cmccalister. Traveling through space has never been easier. 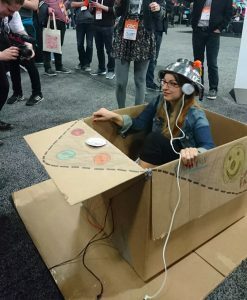 All that is needed is a cardboard box and a little imagination thanks to a group of students and faculty from the Emergent Media Center. 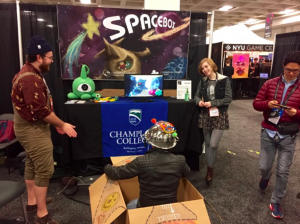 The team created the SpaceBox Game which is a full-body interactive game where players sit in a box and control the on-screen rocketship with their movements. To reach the goal, players have to dodge asteroids and avoid enemy ships. With the help of an agent, the team applied for a patent to the United States Patent and Trademark Office and it is in the pending process. SpaceBox is currently featured at ECHO Lake Aquarium and Science Center as part of their Innovation Playground exhibit. It also will be displayed after Sept. 25 at the Chicago Design Museum as part of their “HEY! PLAY! Games in Modern Culture” exhibition.